Jan Doldersum from Rijk Zwaan has a new slogan: Sharing a Healthy Future. "Dina Abella from Blue Whale promotes a new product METIS. "It's not a plum or a plum-apricot hybrid , but a complete new product! ", according to the 4 companies (including Blue Whale) involved." Samreen Ibrihim at the Total produce stand. Adam Due and Marc Rooms at Safmarine. UK food critic Jay Rayner talks to Tozer Seed's David Rogers. Lotte Mooij and Stefan Spanjaard from Driscoll's with a shopping cart filled with various ingredients that suits perfect with berries. On the left ingredients for Couscous and on the right cupcakes. Ankit Bhargava and Samir Sanhavi from AVI Global who produce all sorts of material for packaging as well as packing for fruit and vegetables. Scott Morton and Jan van der Mey from Peakfresh promoting the Peakfresh solutions for extending the shelf life. Bob Shaw for Compac Sorting Equipment (New Zealand) .. Asia Sales Director of Compac and General Manager of the Taste Technologies Ltd.
Gary Langford from APAL at the Pink Lady stand. Fruit and vegetables from Total Produce. Nagesh Shetty and his colleague take time out of a very busy Indian grape exporting season to come to Berlin. "Aysel Oguz of Eren Tarim, the company just launched their new slogan "Will to Live"
Jacques Du Preez from HortGro, South Africa. The team from BanaBay, Peter, Mark, Anna, Tom and Megan. Emmanuel Descloux from Prince de Bretagne. Prince de Bretagne has a new wooden box with heirloom tomatoes of 750 gram, this product will be launched in April. Also they have small plastic boxes with grape tomatoes. These boxes are easy to put on the shelve for the retailer. Besides they also have new labels, which doesn't show the product, but the product within a recipe to show how you can use the product. Simon Limmer and Bert Barmans, Zespri. Robert Burns and Ajay Jino from the Potato Council with Stuart Booker, CHA and Sophie Lock, Potato Council at the UK reception. Charlotte Stojan of San Lucar (Germany-Spain), PR + Communications dept. Nancy Tucker from PMA, this year they will have some new shows waiting. Gordon Glemius Deputy Director of the DTI, South Africa. Rostan Massey, Turners and Growers at the Jazz stand with the latest apple variety Envy. Stephan Zillgith from Kronen, which is easier to clean and is redesigned, so it becomes less expensive. Marc Meya, one star chef in France, was in the Azura booth to cook with their products and let visitors taste, what you can do with tomatoes from Azura. 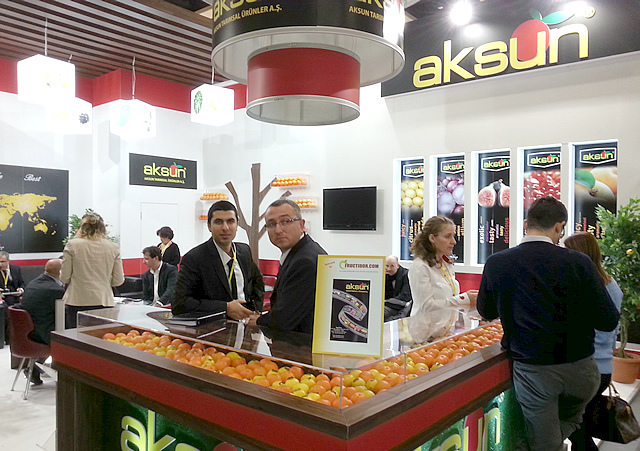 Azura does a lot on taste, they have taste panels within the company, but not only in the company also with consumers. These are blind tests to select the perfect variety for the retailers and consumers. From 350 test-varieties, only 2 will survive for the market. Edwin Jansen from Bud Holland and Patrick Cortes from Gourmet Trading romoting the asparagus. Jeff Lair form Blue Book Service, gives you a more secure way of doing business within the United States. Julien Amar from BioXtend promoting a new ioniser, which kills bacteria, mold and virsues. It is safe for human health and cost effective (works on 44 watt). Vincent Lehalier and François Guigues promoting the organic apple Juliet, but also the various juices. Pierre and Benoit Janny from Janny MT with a customer Torlein Naa Helle promoting their solution for storage and hermetic transport. Yvonne Harz-Pitre from AgroFresh and Erwin Salomon from Van Amerongen celebrate a new partnership to market a new technology for Advanced Control Respiration (ACR) that will combine new equipment and control systems with a comprehensive set of fruit quality management services. The team of Perlim promoting the apples and walnuts. Driscoll's shopping cart shows that you can use berries in various recipes and not even only in a dessert as a topping, but even in a main course with Couscous. Hillary Femal from IFCO promoting the new crate especially designed for product protection of the bananas. MyLord' and Harmonie promoted by the hostesses. Willem Kampschoer from KampExport, although known for Cauliflower, KampExport is expanding their assortment. "Yves Gidoin and Stéphanie Moyou from Fleuron d'Anjou promoting the Shallots and the "old" vegetables." Marie-Laure Étève-Lambertin from COT International, specialist in developing new varieties of apricot, plums and cherries. Mike Svystun from Miatech promoting a new product BioTurbo 100, it is a more compact product and easy to attach to a container on a truck. Nancy Goudreau from Canneberges Québec promoting the cranberries. Tim Evans from Chelan Fresh Marketing promoting their apples. Tim Evans holds the Honeycrisp as this is an apple that's increasing in consumption in the United States. Last year 10 million bushels were sold and still demand is exceeding supply, so new orchards are being planted. Hugo Ramos from Macro Plastics promoting new bins easier to clean and cost effective in transportation as you can pile them up. Karin Defossez next to the chef promoting the produce that is coming from the exhibitors who are part of the Susta pavillion, products like: sweet potatoes, mangoes, carrots and more. Lee and Eliot Cohen from GoMango promote their mangoes from Puerto Rico. 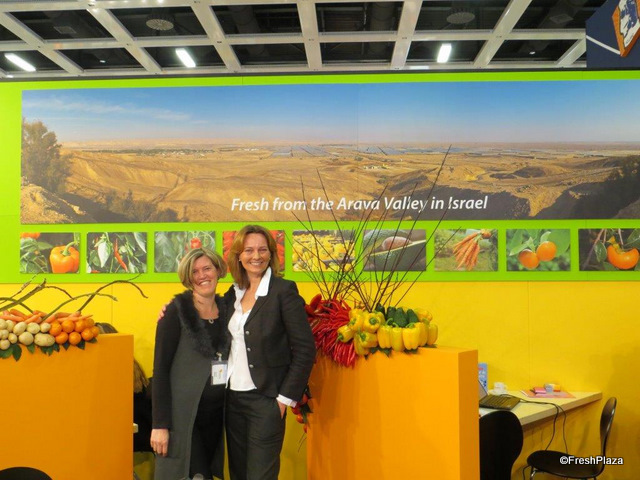 Anna Bieneck Shaw and Dorothea Baxter promoting Fruit Logistica in North America. "Kristi and Joey Hocutt from Triple "J" Produce promote their sweet potatoes"
Jim White and Shad Frane from Del Ozone promoting Cargo3, it keeps the right ozone in a container. Also for a big room, they have a solution. Lonnie Alden from Atlas Pacific promoting a machine that cuts a pineapple into slice and cubes 100% itself. Andrea Dulai and Orsolya Eleod from Garden Trade, Hungary. Gardenjuices are 100% fresh fruit juices. Anke Spree and Luisa Mehl from Eurofins, Germany. Eurofins offers reliable analytical methods for characterising the safety of products and biological substances. 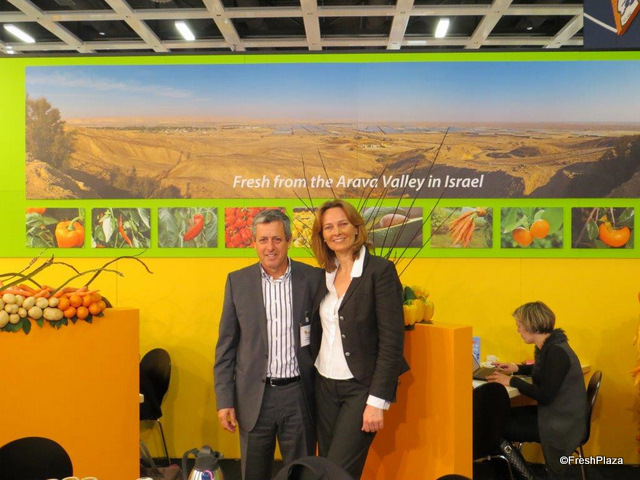 Stephanie Dressler and Nik Becker from Global Fruit Point, Germany. Importing and distributing fruit from all over the world. Maximilian Stohr from Baywa in the stand of Obst vom Bodensee. 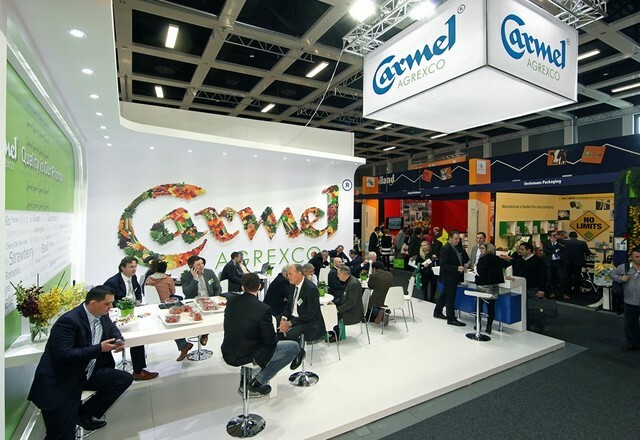 The Obst vom Bodensee Vertriebsgesellschaft mbH markets the products of its own shareholders, VEBO-Frucht and BayWa AG to the German food retail trade and for export. Judith Reiß from 5 am Tag, Germany. Non profit company, their making promotion to eat more fruit and vegetables. Anne Baumert for Landgard, Germany. Landgard is a marketing organisation in the plant and produce sector. Vyacheslav Arsenyev from Prima Group, Poland. Apple producer and exporter. Rafael Zwoinski and his father for Fructo Fresh, Poland. Here they stand with their fresh packed fruit salades without preservatives. Hagdalena Pilch and Stefanie Janeczek from Berrygroup. BerryGroup is a group of producers who grow various species of American blueberry. Kingfruit from Poland. A modern storage facility in the form of cold rooms, which guarantees access to fruits and vegetables throughout the year. Anna Piech and Ilona Kramek for FruVitaLand, Poland. The FruVitaLand is a group of fruit and vegetable producers. FruVitaland group deals in apples, cherries, plums, pears, strawberries, raspberries, currants, and vegetables. Eileen Haas and Katrin Geisthardt for Eisberg, Switzerland. They won the Fruit Logistica Innovation Award 2014, with the 'BBQ grill mix'. Congratulations! Stephan Schlick for Cobana Fruchtring, Germany. Cobana Fruchtring is represented at all of the main markets throughout Germany. Del Monte's special effect, letters of water came down with their slogan. Olga Spirina Jensen for Skals, Denmark. Olga is standing in front of their latest machine. Alexander Bannach and Ralph Mantwitz for Affeldt, Germany. They are standing in front of their machines. Petr Fiala for Htech, Poland. Htech is designing and providing lines for fresh and frozen produce handling and packaging. Thomas Dömer for Multivac, Germany. Multivac is a packing company for the food industry. Franz Rahm and Sander Bakker for MPS food logistics and Apple to go, Austria and The Netherlands. It is a cooperation between the two companies. The apples are laundered and put into a film packet which protects them from environmental impacts. The packaging is from MPS food logistics. Anne Rogers and Tim Hammond at Albert Bartlett, the company is making good progress in the US and also starting up in Australia. Paul Milner from Gourmet Garden joined the Nature's Pride stand to promote the new range of herbs and spices in tubes. The company has been active in the UK and Australia for more than 10 years and is now venturing into Europe. Alan Waters from Donnelly explains that the company has been very successful in the last year and have built a new bigger premises and factory. Manuel Perez, Sales Manager Tozer Seed's Spanish company – Tozer Iberica. Charles Seddon at CN Seeds, who developed the seed for Innovation Award nomination Living Salads. Louise Rix and Paul O'Conner with the Sprout Inhibitor from Restrain. Alan Colbourne from SRS-Frigadon who have seen a lot of development this year in their secondary refrigerant systems, also a major installation in the US. Pictured here with Eric MacGregor from Versatile Refrigeration Ltd, US and Björn Skattberg from Frigdon, Sweden. Stephen Meenaghen shows the new machines from BioFresh, including the Ethylene Management System. The team from Tong Peal, with the new box tipping system from potatoes and root vegetables, Revolver. Tim Young, Charlie Rich and Arne Reinbold. Neeraj Anand from Neeraj International, India. He explains that he sends pomegranates to Europe and Russia and is also looking into the Asian markets. A very enthusiastic Nina Patel from Fresh Express, growers and exporters of Indian grapes. Suhas Sethiya and Swapnil Sethiya from Santosh Packaging, India who produce all kinds of packaging for fruit. Minette De Asis and Ravi Nandi from Rainbow International promoting grapes and mangos from India. Gavin McNally from AG Thames. Jim Dealins at the cross & Wells stand, the company are involved in storage, packing and distribution of fruit. ACE Industrial Supplies were also present with their full range of quality control equipment. Jerry Grower and Tony Smith. Paddy and Rory Callaghan at Nature's Best. Emma Spif, Mark Stewart and Darren Bevan at JDM Food group, who brought an extensive range of products, including their new salad dressings and croutons. The company are looking to get more involved in the European market. Mick Heatherington at the Prophit stand. The team of Meade Potato Company From left to right: Claire Foley, Robert Devlin, Rory Maguire, Philip Meade, Daniel McKenna, Patrick Meade, Jeni Meade, Ruairi Carolan and Mark Rooney. Matthew Mills and Michael Martins from Halls, promoting a new range of ready to eat avocados and mangoes from South Africa. Kenneth Rohrbach and Janice Lazaroo at MacAndrews. Ian Summerfield, CEO of Langmead Farms chats to a visitor. Nominee for the Fruit Logistica Innovation Award 2014. The compostable packaging nets are produced from modal cellulose fibre and are environmentally friendly both in production and in waste disposal. Nominee Fruit Logistica Innovation Award 2014. Extended shelf-life packaging is a packaging to give broccoli significantly increased shelf-life by creating a special natural atmosphere inside the packaging film without chemicals or gases. Nominee Fruit Logistica Innovation Award 2014. Fette di Sole: dried orange slices produced using a very slow drying process. As no sugar is added, they can form part of a low calorie diet. Nominee Fruit Logistica Innovation Award 2014 Reusable plastic container for bananas made of 100% recyclable polypropylene. Nominee Fruit Logistica Innovation Award 2014. Home Harvest Salads- Oriental Mixed Living Salad is a mixture of salad leaves available straight from the growing pot to the table. The mixture includes coriander, mustard, tatsoi and pak choi. Nominee Fruit Logistica Innovation Award 2014. Fioretto is a long thin-stemmed variety of cauliflower with tiny heads. The flesh is somewhat softer than conventional cauliflower while remaining nicely firm. Nominee Fruit Logistica Innovation Award 2014. The grape destemming machine is the first machine to remove grapes neatly and carefully automatically from their stalks. Nominee Fruit Logistica Innovation Award 2014. Vegetable crumbs. Vegetable Crumbs are a pure vegetable coating available in the varieties Carrot Crumbs, Purple Carrot Crumbs, Celery Crumbs, Spinach Crumbs and Red Beet Crumbs.They are free of preservatives or other additives and are gluten-free. Colin Platt explains about the Packhouse Solution Yield Control system at the Marco stand. The chefs at Chiquita cooking up a treat for visitors. Kalpesh Khivasara, INI Farms promoting his new pomegranate arils. The team from Plan and Food Research, NZ. Roger Bourne, Yvonne McDiarmid and Johanna John. Tim Stack and Francesco Brancato show the AirJet sorter from GP Graders. Adrian Head (right), at Herbert promotes the new Centurian machine which replaces the vertical box tipper, it has less maintenance and great product handling. A very busy Westfalia Fruit stand. Jack Evans and Inas Nureldin at Muddy Boots, Jack explains about the new software from the company. This year they have launched the Greenlight Assessments and Greenlight Grower Management aps. Simon Dodds with Holfeld Plastics. Daniel Rutstein, Head of UKTI Germany. Lochy Porter from Angus Soft Fruit. Doug Bell and James Thorburn from Greenvale join the UK reception. 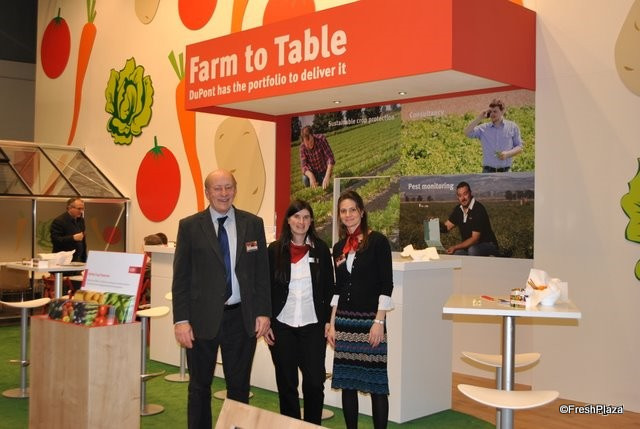 Jan Redpath, Angus Soft Fruit, Clair Hodde, Potato Council and John Gray , Angus Soft Fruit at the UK Pavilion. Stephen Meenaghan, BioFresh, Ajay Jino, Potato Council and Jeremy Baraclough, BioFresh. Jeremy Baraclough and Jonathan Caisley from BioFresh. Robert Hooper, BioFresh and Simon Faulkner from Produce World. 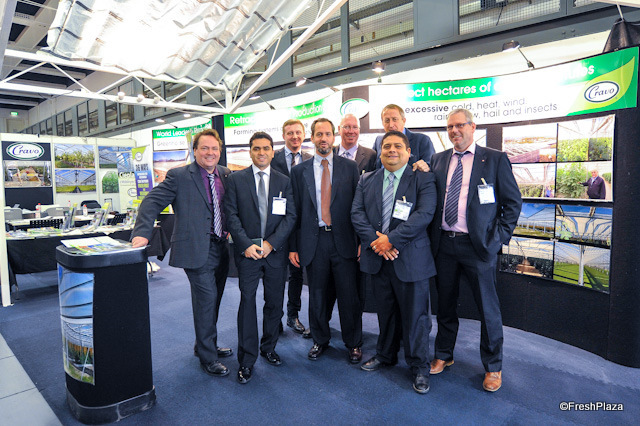 Johnathon Snape, Mylnefield Research, Jeremy Darby, DVL Plant with some visitors to the UK pavilion. Alasdair MacLennan from Cygnet PB Ltd.
A busy reception at the UK stand. The sponsors of the UK pavilion. Hugo Isler for Wisha, Czech Republic. Wisha wants to give the consumers the best exotic fruits. the Ghabbour Farms team: Mina Eissa (Export Sales Manager), Bassiouny (Export Manager), Hassan Zaher (Managing Director) with Esraa Assaf (Logistics Manager). "the Tunisian Pavilion organized by the Agence de Promotion des Investissements Agricoles "APIA" Tunisia"
"Turker Ahtikalmaz with Guler Becer of Turker Ambalaj, leading manufacturer and exporter company of "cardboard edge protectors" in Turkey"
"Once again, Mediterranean Exporter Unions used an excellent slogan in Fruit Logistica.. "From Turkey With Love"
Ahmed Saied, Sales Supervisor of El Gebaly (Egypt), the company is ranked as the first Egyptian citrus exporters according to the last report of the Egyptian Ministry of Trade & Industry body and the General Organization for Export/Import Control (GOEIC). Sudhir Mehta, Commercial Director of MWW- UK with Sherif Attia, President of Green Egypt Co.
".. the "Taste of Morocco" at the Moroccan Pavilion, free food was served during Fruit Logistica such as couscous with chicken, Moroccan sweets and tea, etc." "Tanoura" dance at the Egyptian Pavilion, an Egyptian folk dance usually performed in Egyptian Sufi festivals"
"Nikos, Web Presence Manager of Agrotypos (Greece), just launched the "Totheshelf", the first mobile app linking growers to traders, locally or globally"
Shannon Zhang of Xiamen Bona Industry(China), Sales Dept. Ilana for Hadiklaim, Israel Date Growers Cooperative Ltd.